Description: This is an all-in-one, kid-sized McDonald's® restaurant with a drive-through window, a working cash register, a sizzling grill, a tray return slot, and more! The set was sold with pretend food and cooking utensils. Designed for children ages 3 to 7 years old. 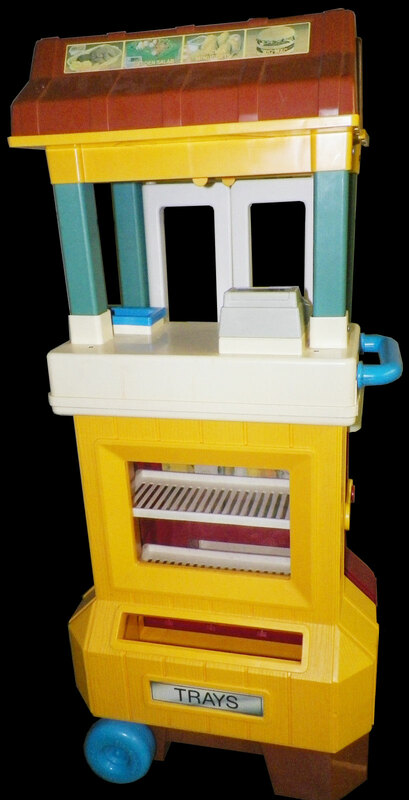 FPT7015 - Large (about 3 foot tall) all-in-one, kid-sized McDonald's® restaurant with a drive-through window, and a working cash register. The base is colored red and yellow with a brown "roof", just like a real McDonald's® Restraunt. It has 2 halves that fold together and 2 blue wheels for portability. FPT7018 - Red plastic "large fry" container with a yellow "M" and white "McDonald's" within a white square box on the cover. FPT7019 - Yellow bundles of plastic french fries molded together. Each bundle has about 6 fries. FPT7021 - Light brown top hamburger bun (smooth, no sesame seed). FPT7022 - Light brown bottom hamburger bun. FPT7023 - Dark brown hamburger patty. FPT7042 - Green sliced hamburger pickles, 3 pickle slices molded together. FPT7017 - Blue rectangular french fry cooking basket with an attached handle on one end marked "Fisher-Price". This looks like real french fry basket that McDonald's® uses in their restaurant. FPT7020 - Blue rectangular serving tray with 2 divided compartments. The ends of the tray have small carry handles. Top center of carry handles have a raised design of a heart with 4 "leaves". 1989 - FPT7028 - This set was sold in a 35-3/8" long, 18-3/4" high, 14-3/8" deep shipper/individual box. 1990 - FPT7399 - This set was sold in a 19-3/8" long, 14-3/8" high, 36-1/4" deep shipper/individual box.